Two cheeky Czechs have launched a campaign aimed at gathering writing implements for the country’s President Václav Klaus. In doing so, they express their support to the leader, who has recently found himself in an embarrassing situation. Vaclav Klaus was captured on video stealing a protocol pen during his official meeting with his Chilean counterpart Sebastián Piñera on Tuesday. The story caused a stir in the Czech Republic. Perhaps the Czech president did not mean to keep the pen or did not know that stealing writing implements is unacceptable for a man of his position. But the fact remains that his minor delinquency was caught on camera, while he was sitting next to Piñera during a news conference and the latter was speaking to journalists. The clip has been uploaded on YouTube exposing the nimble-fingered president. Meanwhile, Chilean President Sebastian Pinera’s spokeswoman Constanza Cea confirmed the president’s guests are free to take the pens, Associated Press reported. President Klaus himself attempted to downplay the incident, saying he often takes mementos from international visits – pens, notepads and so on. He said “many people do that”. The duo plans to gather as many pens, pencils and magic markers as Mr. President could possibly need and present them to him on May 2. 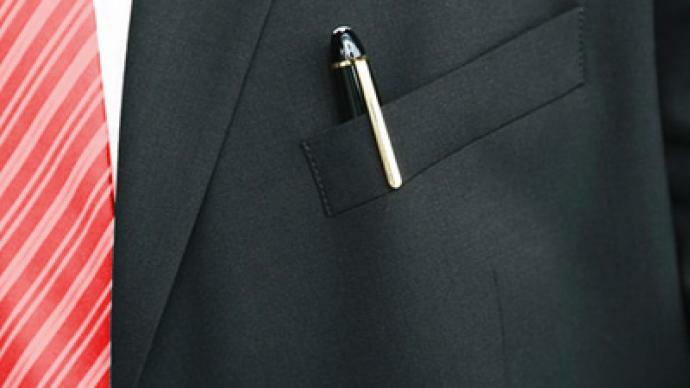 “With our help Mr. President would no longer need to ‘borrow’ other people’s pens during his trips,” the duo hopes. So far, around 5,500 altruists have joined the group.